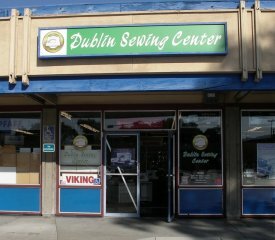 Dublin Sewing Center has been in business in Dublin, California for 37 years. We are a multi-line sewing machine, serger, and sewing furniture dealer. We offer sales and service of Babylock, Bernina, Pfaff, Viking and Elna sewing/embroidery machines and sergers. We are also a full line dealer of all Floriani software, threads, stabilizer, and designs. We sell Horn, Koala and Tailormade sewing and serger cabinets. We are also located in the Jo-Ann Fabric in Fremont on Boscell Rd. Our staff includes quilters, garment sewers, crafters, felters, and machine embroiderers. They are experienced in many aspects of machine work and are ready to help you with your sewing project, thread and needle selection or machine questions. Their goal is to get you creating and keep you creating. We fully support the products we sell. We service most makes and models of machines and sergers including mechanical and computerized sewing machines. Our factory trained and certified technicians service machines on-site. Machines can be dropped off at any of our locations. Estimates are free. In addition to machine sales and service we carry a variety of presser feet and parts for machines. We offer an extensive line of classes and clubs that cover sewing, serger, machine embroidery, quilting, machine felting, and software. Please check the website under classes to view our current offerings.